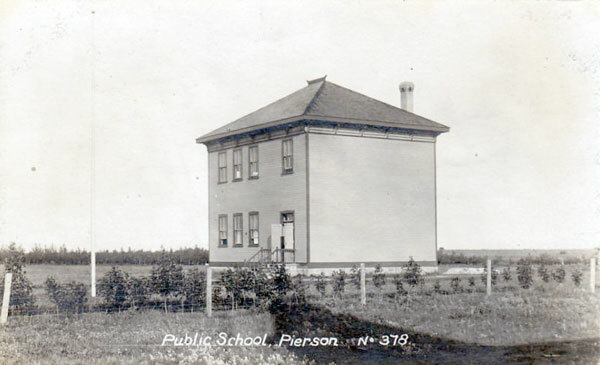 The Pierson School District was established formally in February 1892 and it operated a school in Pierson in what is now the Municipality of Two Borders. In 1956, it became the Edward Municipal School District. Three years later, it became part of the Antler River School Division. 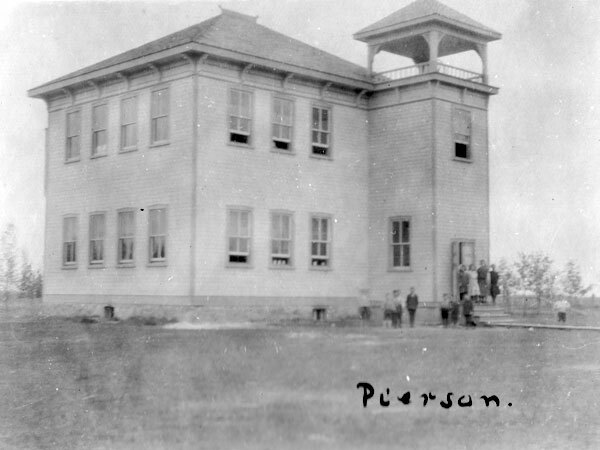 Among the teachers who worked at Pierson School were W. A. Mann (1897), Mina McLaren (1903), Mr. A. McMurchy (1923), Miss E. Basted (1923), Miss Grierson (1947), Mr. Hanna (1960), and Grace Judd (1974-1975). Other names recorded in school records were Arnett, Bremner, Dean Mann, Rathwell, Ali, Austman, Adams, Brennen, Mr. Burke, Miss Burke, Baker, Brown, Bucklaschuk, Buan, Bouldion, R. Boulton, J. Bolton, Brotherhood, Busby, Buga, Brooks, Bride, Bailey, Bernhard, Bodkin, Besuitherick, Crossman. Cassels, Cullen, Coates, Southam (Christianson), Calrow, Cole, Dell, Dyer, Dickson, De Vuyst, Donen, M. Dobbyn, G. Dobbyn, Dawn, Down, Day, Ferguson, Fleming, Faulkner, Friesen (Melvin), Mary Fewings, M. Fewings (Nicholls), R. Fewings, French, Grube, Gardiner, Graham, Ghandi, Gayton, Gilchrist, Hall, Holeman, Haight, Higbee, Huber, Hrabluk, Janz, Julyan, Kirby, King, Kitchen, Kowalchuck, Le Barron, Lacquement, S. Lesniewski, M. Lesniewski, McClintock, Mayes, J. Melvin, E. Melvin, McDonald, Muir, McNabb, Mundell, McFetridge, McLaren, MacKenzie, Marquis, Miller, Nylin, Randy Neuman, P. Neuman, Mr. Neary, Mrs. Neary, Owen, Olds, Olson, G. Penner, Mr. Penner, Peters, Pettinger, Rollo, Rennie, Roy, Reddaway, Ramsey, Reid, Rankmore, Robinson, Sankey, D. Southam, I. Southam, Doris Southam, Skelton (Kernaghan), Smith, Snyder (Deplaedt), Scarth, Sanborn, Sambrook, Trenouth (Murray), D. Wayne Thompson, Tucker, Tokaryk, Veloski, Wright, Wilson, White, Wrobleski, Whenman, Mrs. Yarrish, and Zeller. GR8461, A0233, C131-1, page 108. Harvests of Time: History of the R.M. of Edward by Edward History Book Committee, 1983, pages 171-176. Aerial photograph A11050-318 , Manitoba Air Photo Library.